Torx Plus security screws are a higher security version of the standard 6 Lobe Pin Torx Screw. 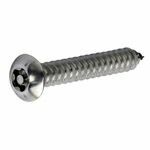 These patented screws feature a five lobe with central security pin drive recess and require a matching security driver tool to instal and remove. Similar to the standard Security Torx Screw, the Patented Torx Plus range of "Two-way" security screws was introduced with a new range of Matching Security Driver Tools. The protection enjoyed by the manufacturers during the period of the patent prevents any other manufacture from copying their Torx Plus design. The main difference between the standard Pin Torx Security Screw and the Patented Torx Plus Security Screw is the format of the drive recess, which on Torx Plus is in the form of a 5 lobe star with a central security pin rather than the 6 Lobe Star format of the standard Pin Torx. These Self Tapping screws are suitable for use with security or safety applications and of course can also be used as a direct replacement for woodscrews. As with other anti tamper fastenings, Torx Plus screws cannot be removed with standard driver tools, so are a practical deterrent to vandals, burglars, etc. Torx Plus Two-way screws require a special matching security driver to install or remove See the Torx Plus Driver Chart for details.